A Rational Faith: A Review of Tim Keller's "The Reason for God: Belief in an Age of Skepticism"
Don't wait. 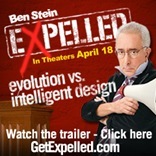 Run to the theatre to see Expelled, Ben Stein's documentary exposing the reasons why the Academy thought police will not allow scientists to teach about intelligent design. It's well-produced, entertaining, and informative. Stein travels all over the world speaking both to the many scientists expelled from teaching for even mentioning "intelligent design," as well as to committed atheists like Richard Dawkins, who essentially believes religious believers are idiots. Running through this movie is a comparison of what is happening to academic freedom with the Berlin wall, with those who want to wall out free-thinkers who want to follow the evidence where it leads. This is not some Bible-thumping fundamentalist propaganda piece, nor is it Creation Science, a movement I always had some difficulty with because of its quite literal interpretation of the Genesis account (aka six 24-hour days), meaning it is treated as simply historical narrative with no poetic component, and in its attempt to fit the Bible to science. These are scientists, some Christian, some not, who simply want to follow the evidence where it leads, and who are quite honest about their biases and presuppositions, something you can't say about many Darwinists. See it now. This movie is playing in major theatres, but films like this don't hang around if people don't buy tickets. Better yet, take a skeptic. Take your kids. Take anyone who simply wants to think. Find a theatre and time here.